There's a three-course meal of NFL games thanks to the Thanksgiving holiday. Kieran O'Connor thinks Chicago need Trubisky to beat Detroit, the Saints should win easily, and Washington could keep it tight against Dallas. "Over Chicago's past six games, Trubisky has 2832 yards of total offense and has accounted for 23 touchdowns to go along with three two-point conversions. He also completely shredded the Lions just three weeks ago, at home, when he managed to amass three touchdowns, zero interceptions and a rushing touchdown. Without him, the Bears could be in trouble so the situation is worth monitoring." The high-flying Chicago Bears with their 7-3 record, head to Detroit, fresh off beating Minnesota at the weekend in the late Sunday game. Interestingly, the NFL schedule has not been kind to Chicago this week. The Bears will become the first team since the 1970 merger to play a Sunday night game followed by a Thursday day game and to add insult to injury (no pun intended), quarterback Mitch Trubisky is currently "day to day" with a shoulder problem. Over Chicago's past six games, Trubisky has 2,832 yards of total offense and has accounted for 23 touchdowns to go along with three two-point conversions. He also completely shredded the Lions just three weeks ago, at home, when he managed to amass three touchdowns, zero interceptions and a rushing touchdown. Without him, the Bears could be in trouble so the situation is worth monitoring. The Lions have had a very up and down season and sit 4-6 but they seem to be a team taking shape; they have restricted teams to just 100 yards rushing in the last two games, quarterback Matt Stafford and wide receiver Kenny Golladay appear to be on the same page but they look to be without running back Kerryon Johnson this week. Johnson, a second-round pick out of Auburn, has been a star in the backfield for the Lions. He has 641 yards rushing (5.4 average) and three touchdowns through 10 games, including two 100-yard performances. He will be missed on Thursday if he can't go. Both teams are NFC North dvisional rivals, so you would expect them to be pumped for this one and though the Lions appear to be a team on the up, they look like they are building towards next season while the Bears are heading for the play-offs and will want to win as many games as possible to attempt to close the gap on the two teams at the top of the NFC; the Rams and Saints. The handicap of -3.5 looks extremely tempting as I fancy the Bears to get it done by more than a touchdown. The biggest of the three games is this one. The Redskins are 6-4 in the NFC East while Dallas are just one behind at 5-5. This game is now a battle for first place in the division and with the regular season games starting to tick on it should be a classic. The big news from Washington this week was the horrific injury suffered by QB Alex Smith. You could tell it was bad one and the news he broke his tibia and fibula was not a surprise. Washington went on to lose that game and now Colt McCoy must step into breach for the Redskins. It's not the first time McCoy has stepped in for them on a Thanksgiving game. He stepped in four years ago to lead Washington to victory, when he was 25/30 for 299 yards and scored with a rushing touchdown. He should find this Dallas side much tougher. 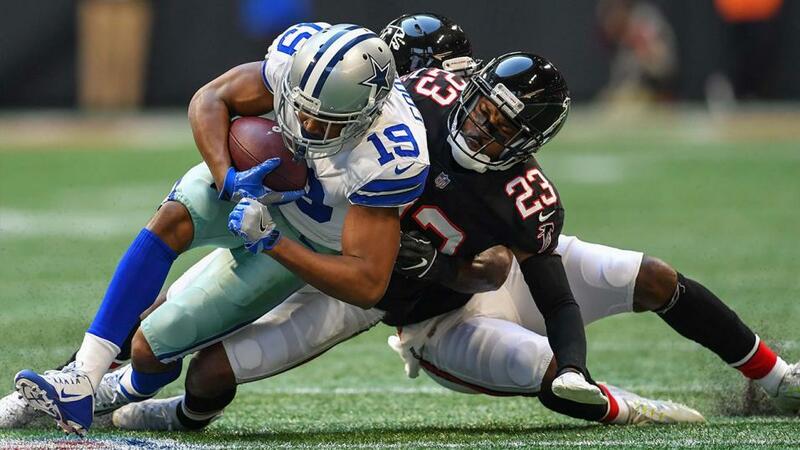 The arrival of Amari Cooper seems to have done exactly what Dallas was hoping for. In the early part of the season they were way too predictable and relied hugely on Ezekiel Elliott and Dak Prescott to pull them out of the fire. The latter of which was being asked to play like Russell Wilson and as good as he is, Prescott is not near the talent of Wilson yet. Dallas' defence have improved as the season has gone on and now Prescott has more options around him as they look a better side, however whoever wins this game would look to be favourite to go to the playoffs, but neither look like they have a chance against likely opponents the Saints or the Rams, it may be a case of be careful what you wish for. Dallas at home, on Thanksgiving, against a back-up QB, it should be an easy win but the Redskins have kept games tight all season and even with McCoy in at QB the handicap looks big and I'm tempted by Washington +7.5. Atlanta Falcons @ New Orleans Saints. Let's be honest, just how good are the Saints right now? Extremely good is the answer. While Kansas City Chiefs and LA Rams are grabbing the headlines, it's New Orleans who are playing the best football right now. They have scored 45,51, and 58 points in their last three games and while there is not a lot in it, they do seem to be a little sounder defensively than the Rams or the Chiefs. They are putting the opponent QB under huge pressure; on Sunday Carson Wentz was 19 of 33 for 156 yards and three interceptions. He took three sacks, and his passer rating was a career-low 31.9. The Saints are bringing the boom and scoring on nearly every drive. Make no mistake, they are the right Super Bowl favourites. The Falcons have been a big disappointment for me this season, I said at the start of the year that Matt Ryan and Atlanta would be contenders, but the fact is they are not. They seem totally incapable of running the ball to any effect and they are now one of the most pass-based teams in the league. They may have Julio Jones in the team but the Falcons have a mammoth task at hand on Thursday night in the Super Dome. Drew Brees can go to Kamara, Ingram, Thomas, possibly Marshall this week and more. They hold all the aces and unless they have a big day then they will cover the 13-point handicap with something to spare and considering the Falcons themselves have been in some high-scoring games the double on the over looks good too.